128-Detector-Row Computed Tomography Coronary Angiography Evaluating Coronary Artery Disease: Who Avoids Cardiac Catheterization? Multislice Computed Tomography Coronary Angiography: Prime Time? Coronary Computed Tomography Angiography for the Diagnosis of Coronary Artery Disease Troy LaBounty, MD, Mauro Moscucci, MD, and Ella A. Kazerooni, MD, MS Abstract • Objective: To review the current application of coronary computed tomography angiography (CCTA) in the diagnosis of coronary artery disease (CAD). • Methods: Qualitative review of the literature. • Results: CCTA has emerged as a potential noninvasive alternative to both existing noninvasive tests for CAD in some patients and invasive coronary angiography (ICA) in other patients. There have been a large number of small, single-center studies comparing CCTA with ICA for the diagnosis of significant CAD that have reported excellent sensitivity, specificity, and negative predictive value in patient populations with a high prevalence of CAD. These studies often exclude segments or patients who do not have complete visualization of all coronary segments and it can be particularly challenging in patients with significant coronary artery calcification, stent placement, or coronary artery bypass grafts. A few small studies have evaluated the use of CCTA in the diagnosis of chest pain in the emergency department. • Conclusion: To date, there are little data on the role of CCTA in comparison with other noninvasive tests for the diagnosis of CAD, including nuclear perfusion imaging and stress echocardiography. Given the ac­curacy of CCTA, it may be useful as a strategy to avoid ICA. The high negative predictive value of CCTA suggests great promise in the assessment of low- to moderate-risk patients with acute chest pain, with the potential for rapid patient triage and lower health care costs. recovery time associated with ICA, there is great interest in the noninvasive diagnosis of coronary artery disease (CAD) using coronary computed tomography angiography (CCTA). Like ICA, this new technique visualizes the artery lumen, but unlike ICA, CCTA also visualizes the vessel wall and can characterize plaque area, volume, and remodeling and can discriminate between calcified and soft plaques (Figure 1 and Figure 2) similar to intravascular ultrasound (IVUS) . There are now established criteria for the appropriate use of CCTA (Table 1) , and CCTA is deemed reasonable (Class IIa recommendation) in the evaluation of suspected obstructive CAD in symptomatic patients. Other uses of CCTA include the detection and mapping of coronary artery anomalies (Class IIa recommendation) , evaluation of congenital heart disease, preprocedure anatomic mapping, and evaluation of cardiac masses; however, these are beyond the scope of this review. The detection of CAD on multidetector-row computed tomography (MDCT) has also been shown to have prognostic implications. In 100 patients who underwent MDCT for suspected CAD, the 1-year incidence of cardiac death, acute coronary syndrome (ACS), or revascularization was 30% in patients with any CAD versus 0% in those with normal coronary arteries . A study of 1138 patients who underwent MDCT and a mean follow-up of 15 months found that patients with absent or mild CAD had a 99.7% survival rate, whereas patients with moderate or severe CAD had an 85% survival rate . Recent data suggest that optimal medical management in patients with stable angina and significant ischemic CAD with or without PCI may result in equivalent rates of death, myocardial infarction, or other cardiovascular events . Given the potential shift from PCI to medical management alone in some patients, there may be a greater role for a noninvasive test such as CCTA to diagnose CAD, with potentially less use of diagnostic ICA. From the Department of Internal Medicine, Division of Cardiology (Drs. LaBounty and Moscucci), and Department of Radiology, Division of Cardiothoracic Radiology (Dr. Kazerooni), University of Michigan, Ann Arbor, MI. Figure 1. Both invasive coronary angiography (A) and coronary computed tomography angiography (CCTA, B) demonstrate a lesion in the right coronary artery (large arrows), with CCTA demonstrating the plaque composition to be mixed, both calcified (small arrow) and noncalcified. Figure 2. Both invasive coronary angiography (A) and coronary computed tomography angiography (CCTA, B) demonstrate a lesion in the left anterior descending artery (large arrows). There is extensive calcification distally on CCTA (small arrow). CAD = coronary artery disease; CCTA = coronary computed tomography angiography; ICA = invasive coronary angiography; NPV = negative predictive value; PPV= positive predictive value. *In addition, segments and patients with stents were excluded from the analysis. †In addition, any segments < 1.5 mm were excluded from further analysis. ‡Muhlenbruch et al defines significant stenosis as > 70%. Figure 3. Stent in the right coronary artery with coronary computed tomography angiography (arrow). Note the difficulty assessing the lumen inside the stent for in-stent stenosis. Figure 4. This volume-rendered image demonstrates 2 patent saphenous vein grafts (arrows). A patent left internal mammary artery is also seen (arrowheads). clinical review and wall in addition to the lumen visible with ICA, although ICA still has higher spatial resolution, is associated with less radiation exposure, and is better able to quantify stenosis. The use of CCTA in low-risk patients with chest pain has great promise for rapid patient triage as well as decreasing health care costs. Additional studies are needed to determine the best roles for CCTA in the evaluation of patients with chest pain. Corresponding author: Ella A. Kazerooni, MD, MS, Taubman Ctr., Rm. 2910K, 1500 E. Medical Center Dr., Ann Arbor, MI 48109. Financial disclosures: None. Author contributions: conception and design, TL, MM, EAK; analysis and interpretation of data, TL, MM, EAK; drafting of the article, TL, MM, EAK; critical revision of the article, TL, MM, EAK. detector multislice computed tomography to intravascular ul­trasound. Catheter Cardiovasc Interv 2006;68:8–10. Van Mieghem CAG, Cademartiri F, Mollet NR, et al. Multislice spiral computed tomography for the evaluation of stent patency after left main coronary artery stenting: a comparison with conventional coronary angiography and intravascular ultrasound. Circulation 2006;114:645–53. Anders K, Baum U, Schmid M, et al. Coronary artery bypass graft (CABG) patency: assessment with high-resolution submillimeter 16-slice multidetector-row computed tomography (MDCT) versus coronary angiography. Eur J Radiol 2006;57: 336–44. Chiurlia E, Menozzi M, Ratti C, et al. Follow-up of coronary artery bypass graft patency by multislice computed tomography. 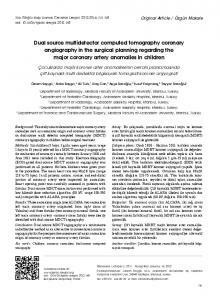 Am J Cardiol 2005;95:1094–7. Schlosser T, Konorza T, Hunold P, et al. Noninvasive visualization of coronary artery bypass grafts using 16-detector row computed tomography. J Am Coll Cardiol 2004;44:1224–9. Malagutti P, Nieman K, Meijboom WB, et al. Use of 64-slice CT in symptomatic patients after coronary bypass surgery: evaluation of grafts and coronary arteries. Eur Heart J 2006; [Epub ahead of print]. Pache G, Saueressig U, Frydrychowicz A, et al. Initial experience with 64-slice cardiac CT: non-invasive visualization of coronary artery bypass grafts. Eur Heart J 2006;27:976–80. Ropers D, Pohle FK, Kuettner A, et al. Diagnostic accuracy of noninvasive coronary angiography in patients after bypass surgery using 64-slice spiral computed tomography with 330-ms gantry rotation. Circulation 2006;114:2334–41. Hoffmann U, Nagurney JT, Moselewski F, et al. Coronary multidetector computed tomography in the assessment of pa­tients with acute chest pain [published erratum appears in Cir­culation 2006;114:e651]. Circulation 2006;114:2251–60. Goldstein JA, Gallagher MJ, O’Neill WW, et al. A randomized controlled trial of multi-slice coronary computed tomography for evaluation of acute chest pain. J Am Coll Cardiol 2007; 49:863–71. Gallagher MJ, Ross MA, Raff GL, et al. The diagnostic accuracy of 64-slice computed tomography coronary angiography compared with stress nuclear imaging in emergency department low-risk chest pain patients. Ann Emerg Med 2006;49:125–36. Hacker M, Jakobs T, Hack N, et al. Sixty-four slice spiral CT angiography does not predict the functional relevance of coronary artery stenoses in patients with stable angina. Eur J Nucl Med Mol Imaging 2007;34:4–10. Copyright 2007 by Turner White Communications Inc., Wayne, PA. All rights reserved. Report "Cardiovascular disease is the leading cause of death in. Coronary Computed Tomography Angiography for the Diagnosis of Coronary Artery Disease"